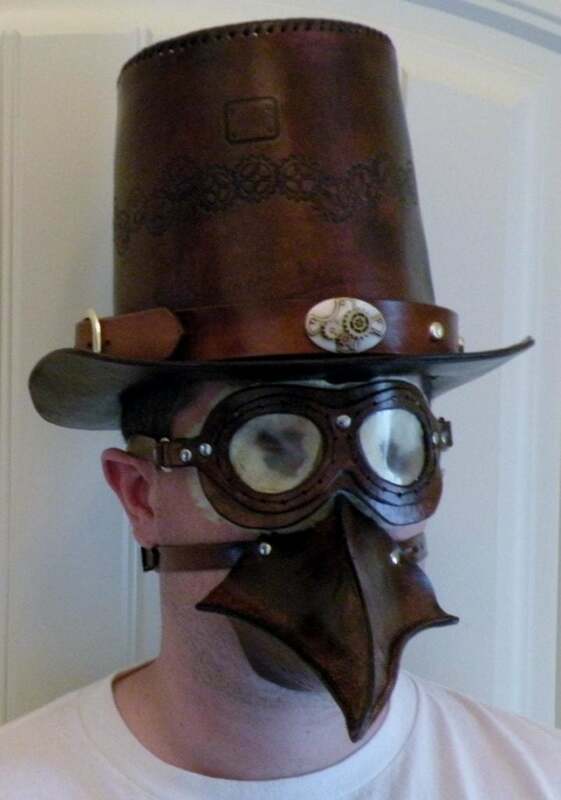 SteamPunk…a blending of science fiction/fantasy, early industrial revolution post-apocalyptic﻿ visions, and the Victorian period. 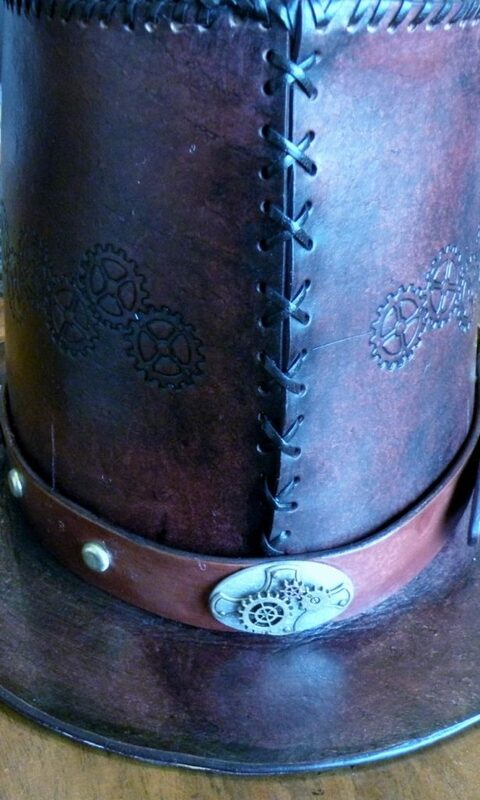 Typically involves steam powered mechanisms, so gears and leather feature prominantly. 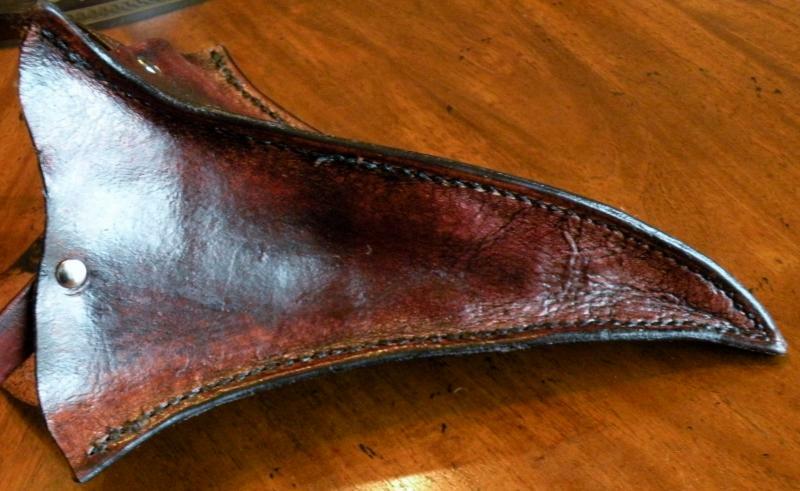 The items on this page were inspired or influenced by this sub-culture. 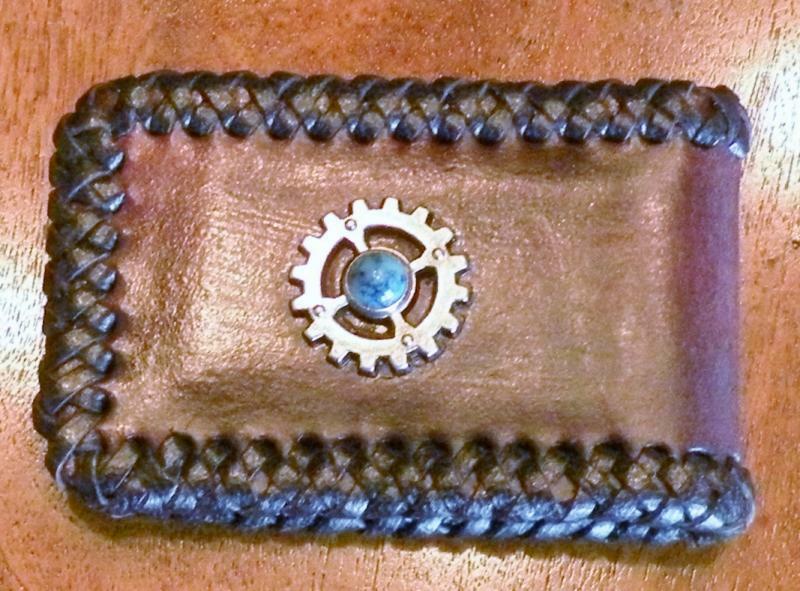 This magnetic money clip features a metal gear cog on one side with a tourquoise stud, and a filigreed gear on the opposite side backed by blue snake skin. 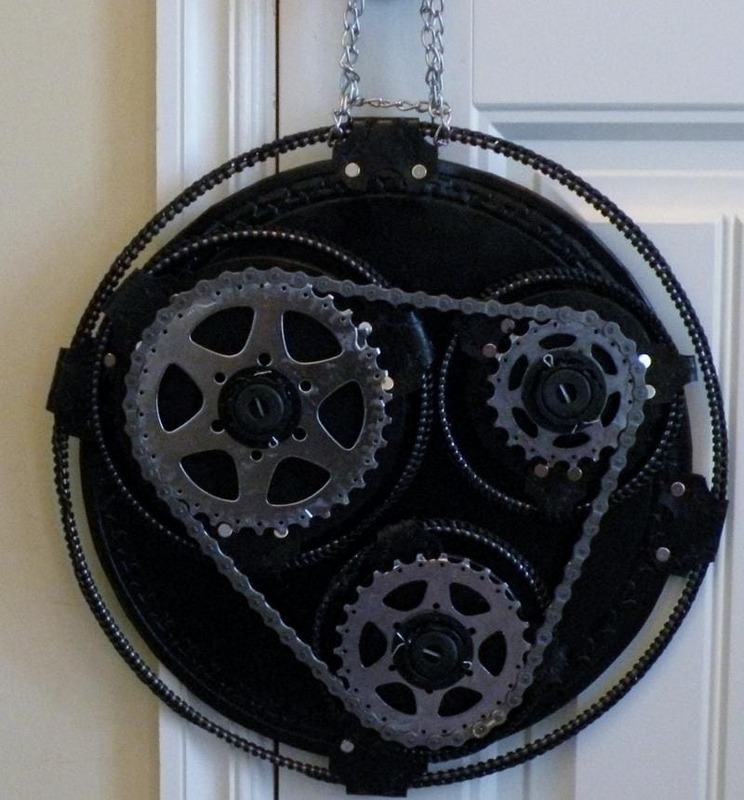 Recycled bicycle cogs and chain pounted on leather and metal rings. Definitely a conversation piece for your wall! 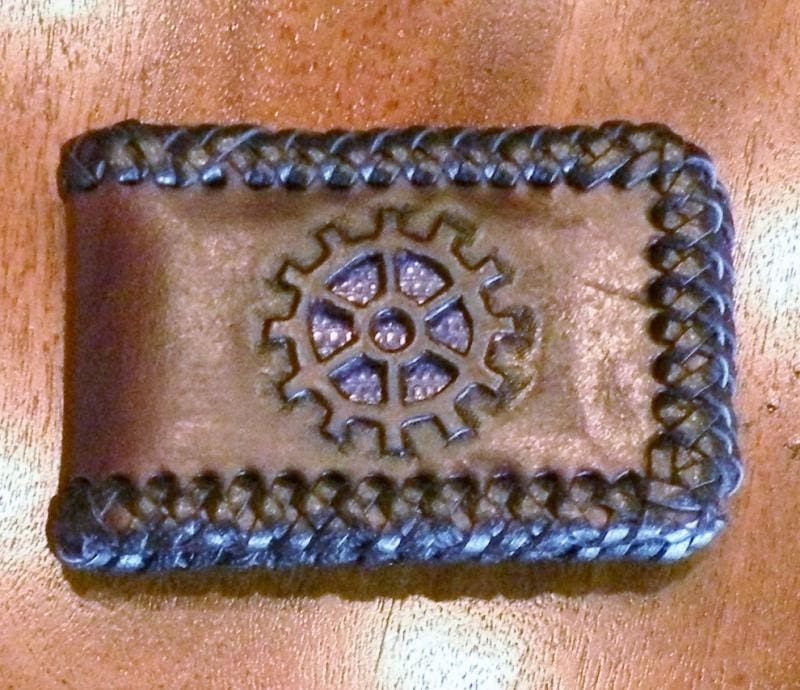 The larger ring is 14 inches in diameter and the leather suspended inside it supports the other three rings similarly mounted on leather in smaller rings (5″ and 7″ diameter). The chain and cogs do turn. 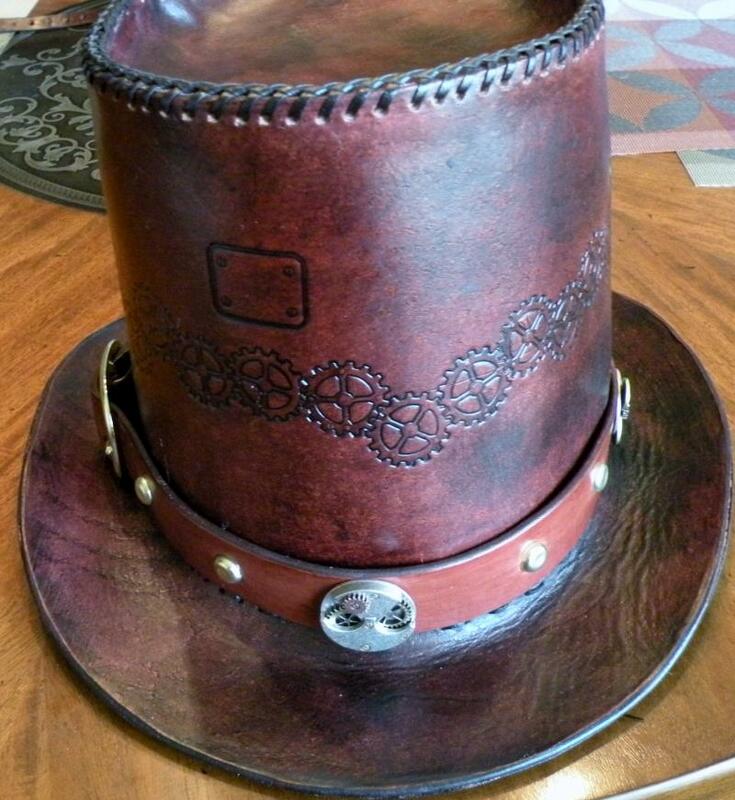 A hand﻿Front View of Hat and Hatbandmade “top hat” with hatband. 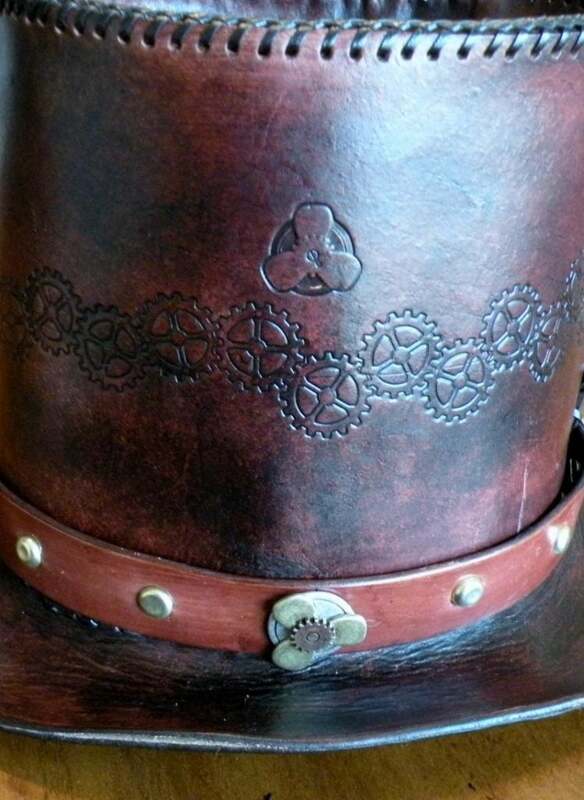 The conchos on the hatband all have moving parts! 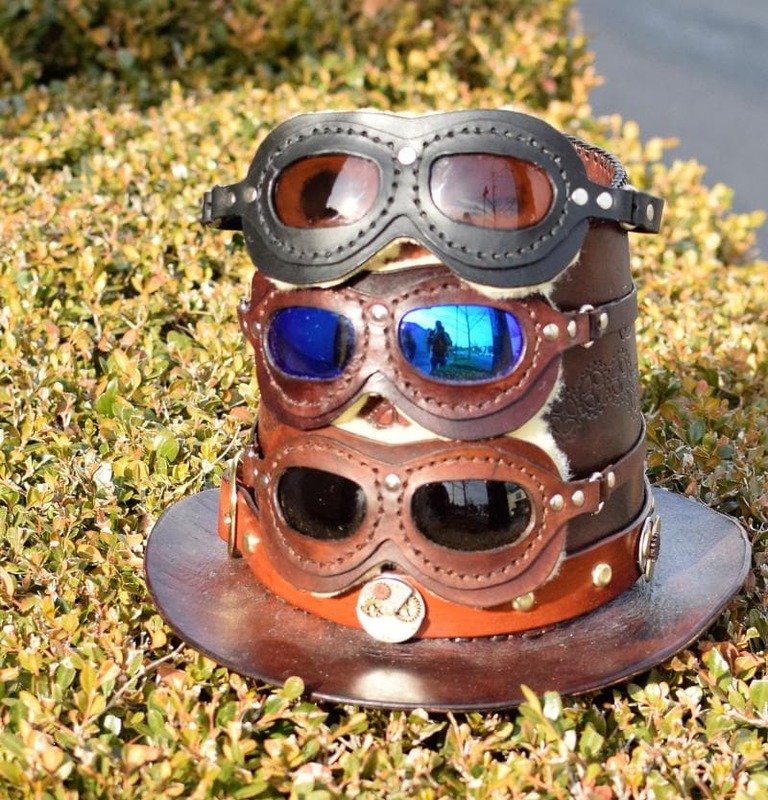 Handmade from leather and sheeps wool, these aviator’s goggles are fitted with polarized sunglass lenses and are thus fully functional, as well as fitting with a costume! 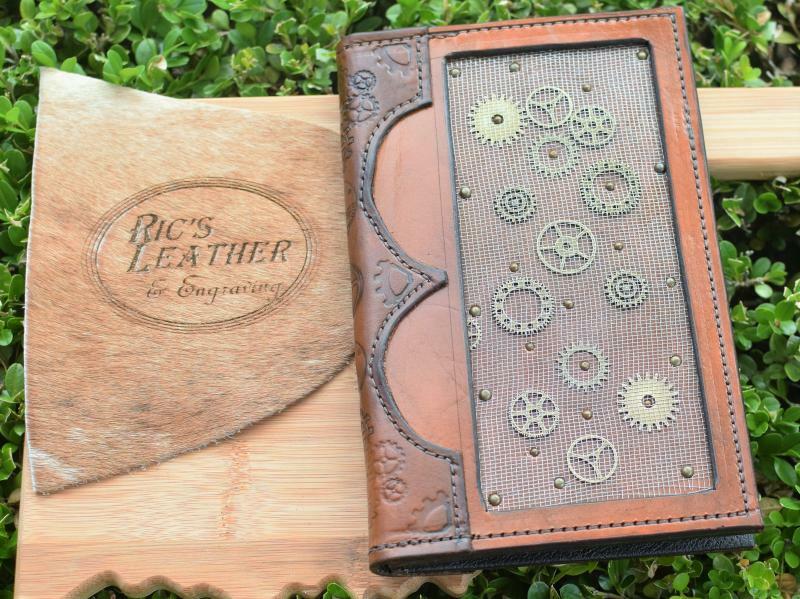 Tired of plain jane covers for your notepads? 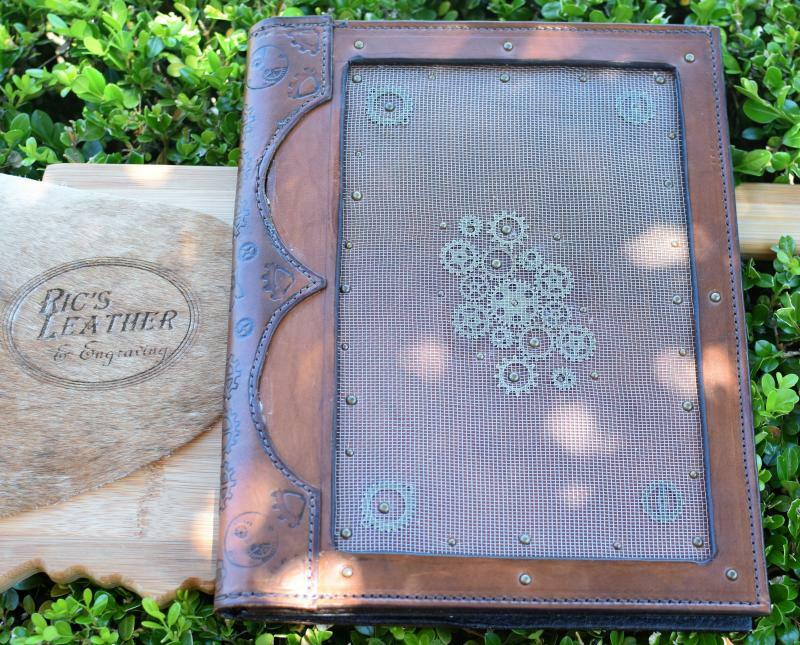 Go Steampunk…sized for either 5″x8″ pads or 8.5″x11″ pads….could even do legal size! Based on the Venetian Plague Masks, this mask would be used by the fictional steampunk doctor to try to avoid contracting the plague as he went about his rounds. 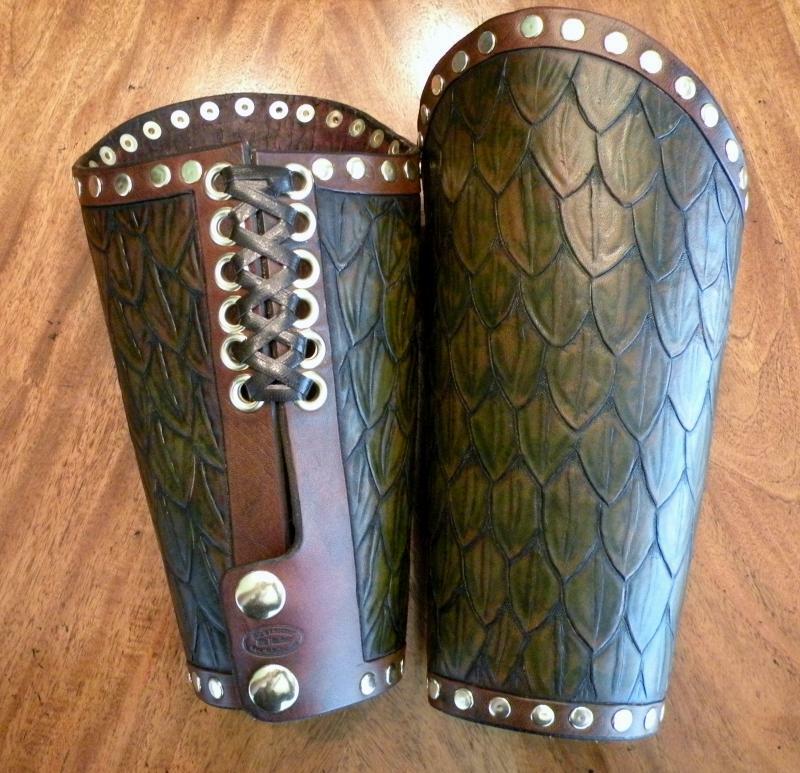 Protect your arms in battle with these leather bracers.﻿ Tooled to resemble dragon skin/scales. 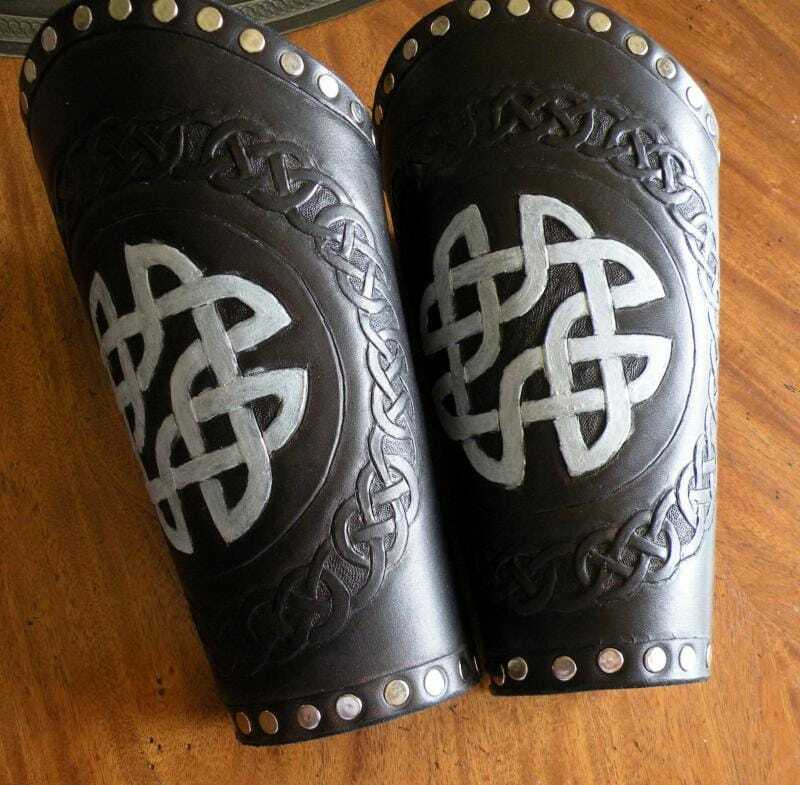 Another set of bracers, but this time with celtic knots tooled on them.